Duke Chapel, the Durham Bulls Athletic Park and the American Tobacco Campus are among the destinations I’ll be featuring today. 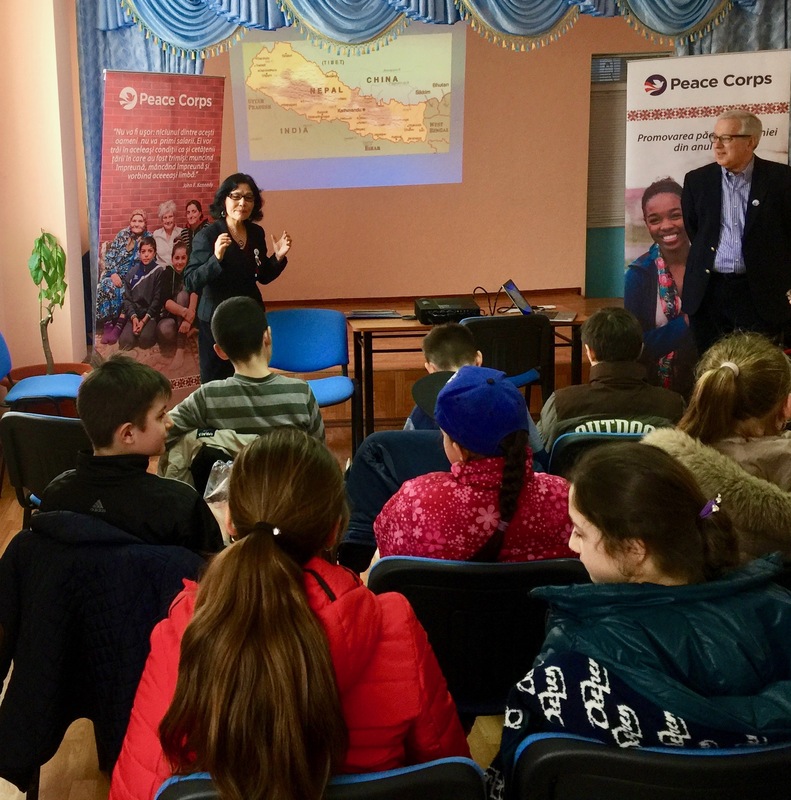 Wait, you’re thinking, isn’t this blog about our experiences as “not exactly retired” Peace Corps volunteers in Eastern Europe? Yes, exactly. On Thursday, we handed out souvenir postcards of Durham, N.C., as prizes for students competing in geography quizzes we held during two presentations we gave in the town of Criuleni. Watching them react to the Durham bull and other landmarks from back home was an experience we won’t forget. Who wants to answer the geography question and win a postcard from Durham, N.C.? As I’ve written before, North Carolina has a special relationship with Moldova. Just in my group, we have volunteers from Asheville, Boone, Charlotte, Winston-Salem, Raleigh and, of course, Durham. Champa and I went to Criuleni to help commemorate Peace Corps Week, the annual celebration of President Kennedy’s founding of the Peace Corps on March 1, 1961. We joined other volunteers and country director Tracey Hébert-Seck in speaking at a week-long series of events organized by volunteers Chris Flowers and Rebecca Lehman. 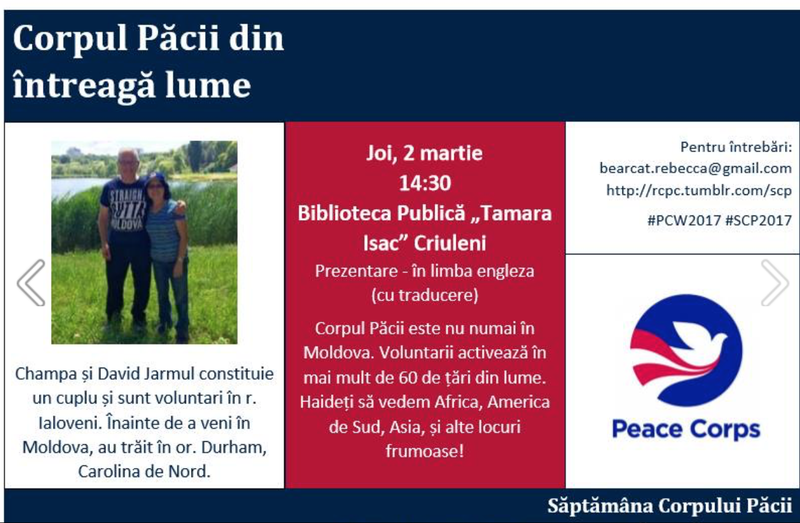 Further to the south, in Causeni, volunteer Anne Reed and her colleagues are planning a big event on Saturday to celebrate Peace Corps Week and International Women’s Month. I don’t know whether Moldovan tourists will now start arriving in droves in the Bull City. But if they do, I’m sure they’ll enjoy themselves, whether they watch a show at DPAC, an exhibition at the Nasher Museum of Art, the Hayti Heritage Center, the weekly farmers’ market or a local beer at Fullsteam. After all, I have the postcards to prove it. So fun that you all got to share about our wonderful home!! This reminded me of when I taught Freshman Seminar at MTSU and had my students do presentations about their home town for the class. It was always fun to hear about tiny places in TN I never knew about and also allowed the students a fun way to practice their presentation skills. Thank you for sharing Durham with your new friends in Moldova! !